In the 1891 re-organisation, the parish was allocated to the Marton subdistrict of the Gainsborough Registration District. The North Lincolnshire Library holds a copy of the parish census returns for 1841 through 1901. You can also perform a more selective search for churches in the Harpswell area or see them printed on a map. The Anglican parish church is dedicated to Saint Chad. 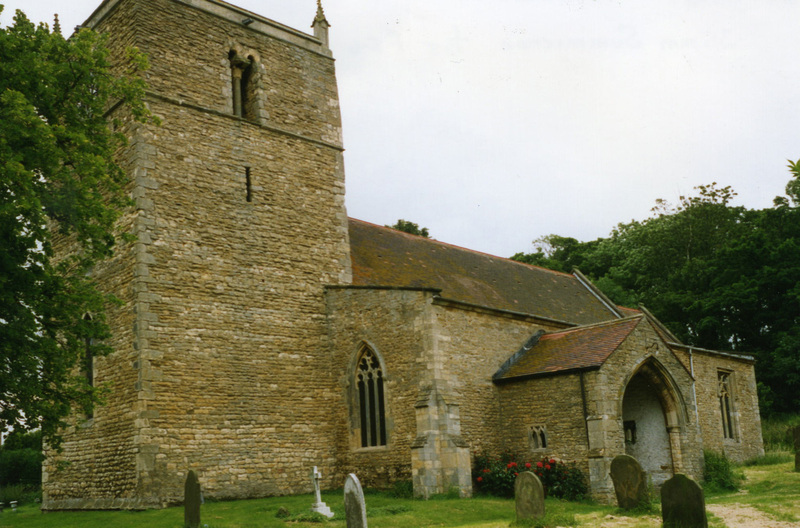 The church partially dates back to the Norman era. The church was restored in 1890-91. In the basement of the church is a large stone slab bearing the figure of a priest. It has an undated Norman French inscription to John GERE, parson of Harpperswelle. The church contains a monument to William de HARRINGTON, rector here circa 1346. There is also a memorial to a W. HARRINGTON, rector, who died in 1697. In the chancel is a monument to William TYRWHITT, esq., dated 1599. In the churchyard is a monument to: Thomas BULCOCKE clerk, Minister of this town 38 years. Died 10 May 1633. And to: Hanvard BULCOCKE was Minister in 1634 and died 13 Oct 1669. It's a SIGN! of the church, sometimes overgrown by ivy. Photo taken 2011. Sheila FENTON has provided a photograph of the church on the Wendy PARKINSON web site. Parish registers exist from 1559, but the Bishop's transcripts only go back to 1595. The North Lincolnshire Library holds a copy of the parish register entries for baptisms 1559-1812, burials 1559-1812 and marriages 1559-1842. 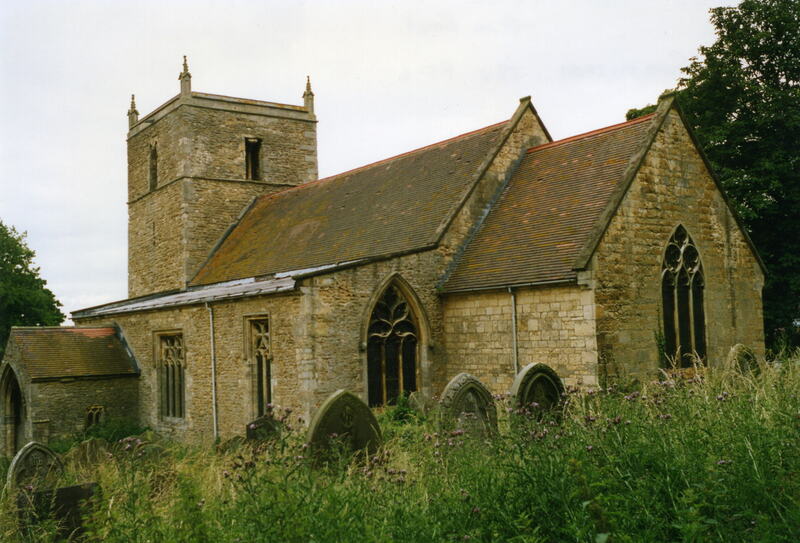 Harpswell is both a parish and a small village about eight miles east of Gainsborough and nine miles north of Lincoln. The parish itself is bordered on the north by Hemswell parish, to the east by Springthorpe and Heapham parishes and to the south by Glentworth parish. The parish covers about 2,150 acres. The village can be found at the intersection of the A631 trunk road east of Gainsborough and the B1398 north out of Lincoln. If coming north out of Lincoln, it is probably best to take the A15 to the A631 and turn east for one mile, but you'll miss some beautiful scenery. J. THOMAS provides a peaceful scene of grazing on Geo-graph, taken in 2012. Ask for a calculation of the distance from Harpswell to another place. You can see the administrative areas in which Harpswell has been placed at times in the past. Select one to see a link to a map of that particular area. In 1842, there were only seven farms covering the entire parish, except for the village. The sole landowner was Sir Thomas WHICHCOTE of Aswarby. A branch of his family used to reside here. In 1872, there were the same seven farms. The sole landowner was still Sir Thomas WHICHCOTE of Aswarby. In 1900 and 1913, the sole landowner of the parish was Sir George WHICHCOTE, baronet. There are directory entries for Harpswell Hall, but I could find no description or history. Richard CROFT provides a photograph of the RAF graves in the churchyard on Geo-graph, taken in 2009. Although we are not sure of the relationship to Harpswell, there's a photograph of a Culloden Memorial also, taken in 2009. David HITCHBORNE provides a photograph of the Roll of Honour in the church on Geo-graph, taken in 2004. Unfortunately, the names are difficult to discerne. The name Harpswell comes from the Old English Hearpe+wella or Hearpere+wella for "spring or stream of the harp or harp player". The name appears in the 1086 Domesday Book as Herpeswella. The name is recorded in some records as Harpperswell. White's 1842 Directory lists the following names in the parish: Jno. BROWN, Godfrey JARVILL, Jno. OGELSBY, Richard OGELSBY, Thos. RANBY, John SMITH and Wm. WARD. White's 1872 Directory lists the following names in the parish: Christopher F. HALL, George CASSWELL, John Thomas HOLMES, John OGELSBY, Richard OGELSBY, William STEVENSON, Thomas TATAM and Samuel TURNER. Kelly's 1900 Directory lists the following names in the parish: Coggon BRUMBY, Frederick Wm. TATAM, Thomas TATAM, Thomas TURNER and John WRIGHT. Kelly's 1913 Directory lists the following names in the parish: Coggon BRUMBY, Charles TATAM, Frederick W. TATAM, John TATAM and Thomas TURNER. The parish was in the ancient Wapentake of Aslacoe in the West Lindsey district in the parts of Lindsey. The citizens of this parish have elected to forgo a formal Parish Council. Instead they hold periodic Parish Meetings to discuss civic and political issues. As a result of the 1834 Poor Law Amendment Act, this parish became part of the Gainsborough Poorlaw Union. The children of this parish attended school in Hemswell.